I don’t have sea bass that often. When I do, I utilize this fish to its maximum. As one of my favorite and one of the most expensive fish, I try to make the most of my money. What do you do when you need to impress guests or growling stomachs? I recently made this succulent mouthwatering pan seared sea bass – a truly fine catch. I actually owe hubby for the inspiration as it was he who suggested sea bass to me. The meat on the sea bass is very fleshy and eat bite literally melt in your mouth. I like to drizzle some fresh lemon juice over this buttery fish. This method enables the acidity to break up the grease and add an additional dimension to the flavor. This sea bass recipe is not as complicated as it looks. The magic behind this recipe is the seasoning and the perfect sear. As elegant as this pan seared sea bass dish seems, the preparation and cooking is a cinch. Gourmet dishes don’t have to be labor intensive. Cooking fish requires attention to detail and a lot of care. There is nothing that irks me more than overcooked dried fish. Overcooking a sea bass is one of the worst sins you can transgress when it comes to cooking fish. It would also be a waste of your effort and money. All I really did was season the fillets with salt, pepper, paprika, cumin, onion powder and garlic powder with a lot of TLC. Then I added little finishing touches with some fresh herbs and lemon juice. Pat fillets dry and score just through skin in 4 places. Diagonally cut each fillet in half and season with paprika, cumin, onion powder, and garlic powder. In a heavy skillet heat oil and over moderately high heat until foam subsides and sear fish, skin sides down, about 3 minutes, or until skin is golden. Turn fish over and cook 2 minutes more, or until just cooked through. Remove skillet from heat and stir in lemon juice and herbs. Season with salt and pepper. Spoon sauce over fish and serve. 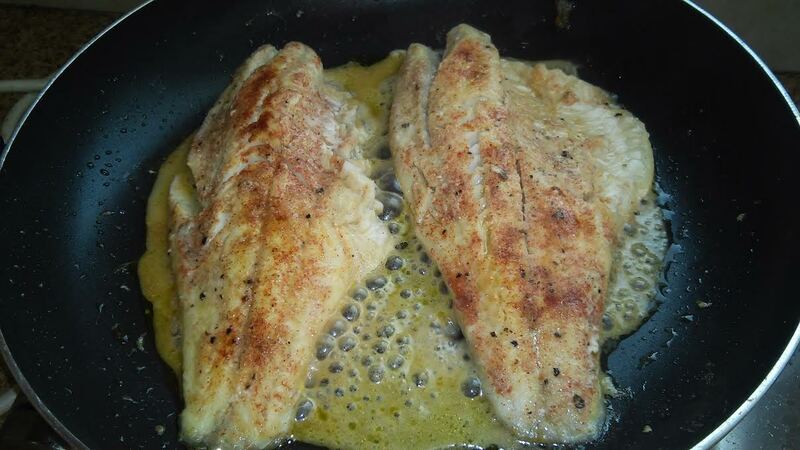 This entry was posted in Fish, Gluten Free and tagged pan seared sea bass, sea bass recipes.